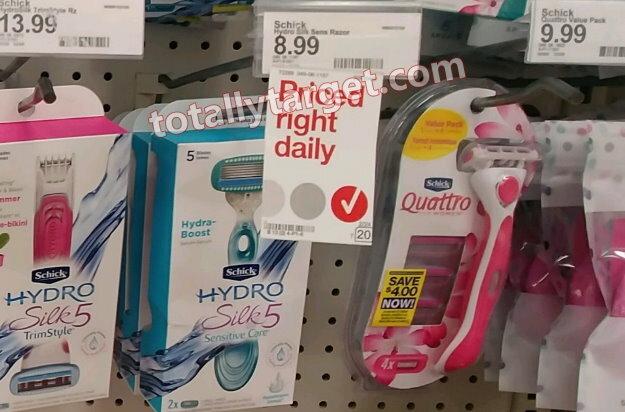 We have a new high-value printable coupon available to save $4/1 Schick Quattro for Women, Intuition or Hydro Silk Razor or Refill (excludes Disposables). This coupon is great to stack with our in-ad Target coupon for a FREE $5 Gift Card with a beauty/personal care purchase of $20 or more. We also have a rebate offer on the ibotta app to make for a nice deal…. -$8 (use two $4/1 Schick Quattro for Women, Intuition or Hydro Silk Razor or Refill (limit 2). However, since you only have to meet the spending threshold of $20, you could actually mix & match with something else and get an even cheaper price per razor plus get a freebie….